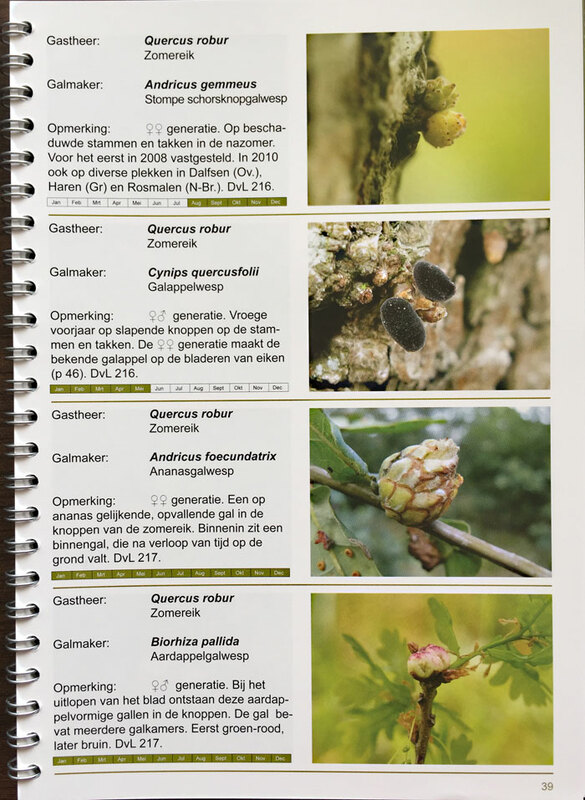 A small book, designed to de used in the field, with pictures, and a short text, covering 236 of the commonest galls. A sample page is given below. The price in the Netherlands is € 15 (elsewhere in Europa € 19.15). To be ordered from the author, r.j.koops@gmail.com . Aleurotuba jelinekii; Andricus sternlichti; Antherospora scillae; Aphis spiraecola, spiraephaga; Dasineura tympani; Discogloeum veronicae; Gymnosporangium clavariiforme; Ochsenheimeria taurella; Peronospora alsinearum; Puccinia adoxae, obscura, violae; Septoria tanaceti; Stigmella pyrellicola; Taphrina rhizophora; Urocystis anemones, ficariae. In order to warrant the continuity of this website, EIS Kenniscentrum Insecten (Center of Expertise Insects) and Naturalis have confirmed their support. The logos of both organisations are displayed on the site. The pictures of Melanustilospora ari on this site did not represent this fungus. Aceria macrorhyncha; Andricus callidoma, foecundatrix; Bucculatrix frangutella; eggs of Cacopsylla spec. ; Coleophora laricella; Dasineura aparines; Hexomyza simplicoides; Phragmidium rosae-pimpinellifoliae; Plenodomus visci; Podosphaera leucotricha; Puccinia allii, bornmuelleri, liliacearum; Pustula obtusata; Rhopobota ustomaculana; Sphaeropsis visci; Tranzschelia anemones; Trisetacus pini. Andricus caputmedusae, lucidus, sieboldi; Camarotoscena speciosa; Ceutorhynchus assimilis; Contarinia anthobia; Lipara lucens; Macrodiplosis pustularis; Monarthropalpus flavus; Mycodiplosis larvae; Podosphaera leucotricha; Puccinia menthae; Uromyces pisi. Tuta absoluta found on Solanum dulcamara, nigrum, triflorum. correction: galls on Bupleurum falcatum were not caused by Eryngiophaga hungarica but by: Planchonia arabidis. Phtorimaea operculella: for Solanum dulcamara. In 2014 an as yet unidentified gall midge has appeared in Britain that destroys the flowers of Agapanthes. Enigmatic appearance of the spring generation of Tetraneura ulmi in August. Phyllocnistis cf labyrinthella found on Salix pentandra! Correction: A gall on Dittrichia viscosa, attributed to Acodiplosis inulae, actually is the work of Myopites stylatus; with thanks to Jordi Montobbio. 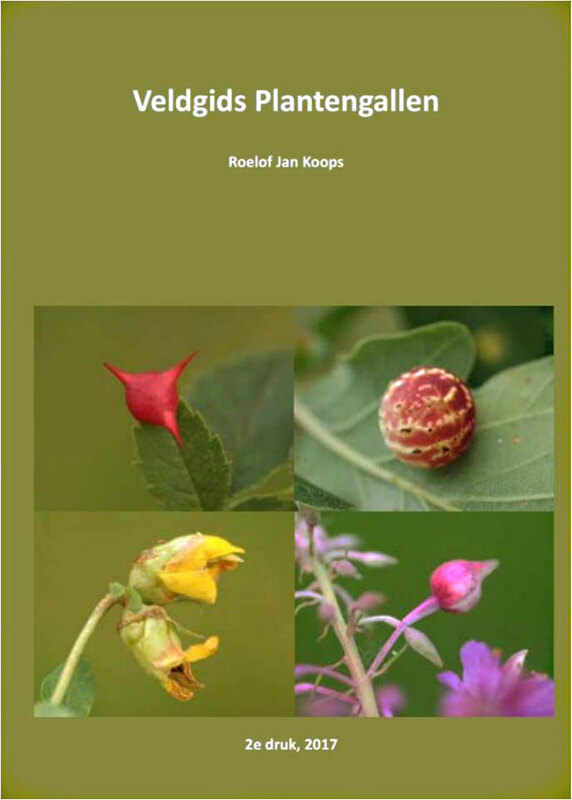 British Phytoptus erinotes and Dutch Ph. abnormis probably are Ph. tetratrichus. Serious doubt about the identification of the mines of Coptotriche marginea and heinemanni; a closer study is urgently needed. Scolioneura vicina possibly is a synonym of S. betuleti. New hostplant of Dialectica imperialella: Pentaglottis sempervirens. The solution of an old problem: the youth mine of Swammerdamia caesiella. Stigmella arbusculae is a valid species. New record of Cameraria gaultheriella in the Netherlands. Tuta absoluta observed in Belgium in the open air. Antispila treitschkiella again reaches pest proportions. Winter generation of Phyllonorycter messaniella found in the Netherlands. The dorsal spinulation of the abdominal segments of the pupa of Coptotriche marginea strongly differs from th description by Patocka & Turcani (2005a). British material of margineashows a spinulation that is identical to what is illustrated by them for C. heinemanni . The ‘real’ Agromyza reptans finally found in the Netherlands! New material found of Phytomyza griffithsi , now definitely a Dutch species. Aulagromyza heringii seems to advance strongly in the Netherlands.